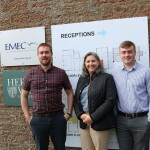 EMEC had the pleasure of hosting three student interns this summer; Truce Jack, Michael De Bruin and Chris MacDonald, who have kindly shared their experience with us. To hear all about their time at EMEC, watch the vlog below or read Truce’s personal account. As a part of my course at University I took a mix of biology/earth science courses in my first two years and strictly earth science/geography modules in these past two. Learning facts for an exam and sitting through two hour lectures are all necessary for my degree, but I was fortunate that I got to actually contribute to work that is not only useful to me as a hands on learning experience, but to one of the world’s most exciting industries. My internship lasted from the last week of June until the first week of September 2018. 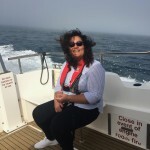 During that time, I helped the Environmental and Consents Specialist with various environmental monitoring tasks in relation to developer portfolios and the overall environmental characterisation of the test sites. One of my first and most exciting projects was to further develop a model to estimate the risk of collision between marine mammals and a tidal turbine device. The results of this model are particularly vital in order to assess each device’s potential impact on the marine mammals present in and around the test devices at EMEC’s Fall of Warness test site. I also updated the Environmental Description reference documentation for EMEC’s scale test sites at Scapa Flow and Shapinsay Sound. Within these documents, I critically reflect on present legislation and the environmental conditions and receptors which shape the sites where developers would place their devices for testing. 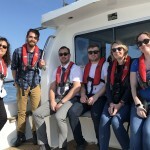 To support one developer’s environmental monitoring programme, I conducted an analysis of the impact that the mooring system may have on the benthic (seabed) environment, utilising video footage reaching back over a period of 12 years. In addition, the seal behaviour recorded within EMEC’s Wildlife Observation programme was analysed and compiled into a brief pamphlet for developers regarding typical seal behaviour and potential collision risk at the Fall of Warness site. To know that I have completed work that will be actively used by EMEC is such a rewarding feeling. I’ve had a great time working with everyone at EMEC and truly felt a part of the dynamic, growing, committed team. We are all working towards the goal of helping ocean energy succeed. It was such a fantastic experience to be in an international working environment with colleagues from all over the world. 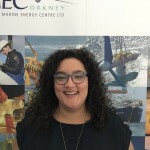 I learned so many things about the marine energy sector, especially the importance of stakeholder engagement within environmental and consent projects, the direct consequences of those decisions for developers and for test centres like EMEC. 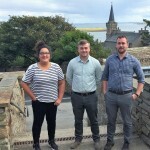 I find it wonderful that the Island’s close-knit communities actively get involved with several sustainability and renewable energy initiatives, such as the Orkney Renewable Energy Forum. This is so much so that sustainability and community are intertwined. Orkney will always be home for me, even if I’ll be away for a while. 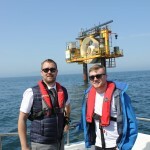 This experience just confirmed my personal commitment to help the advancement of marine (and further renewable) energy in the future. I will be graduating from St Andrews in several months’ time and hope to begin a Masters in Environmental Management and Physical Planning next September, all the while staying involved with the ever expanding industry under the waves. Interested in an Internship / Work Experience with EMEC? Send a covering letter which highlights your skills, knowledge and experience and your CV to hr@emec.org.uk. We will be in touch once your application has been received and will provide more information on the application process. We usually identify internships early in the year with placements taking place over the summer for approximately three months. The internship programme at EMEC is not guaranteed: the types of internship on offer depend on organisational capacity and demand, and are subject to change at the sole discretion of the company.